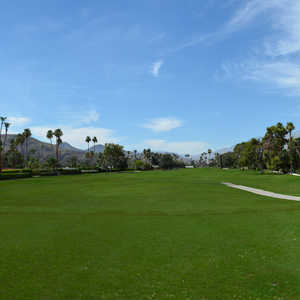 LA QUINTA, Calif. - Mention Palm Springs and images of an exclusive rich playground spring to mind. A reputation as one most hoity toity towns in America dies hard. Maybe, it's the ties to the original stars of Hollywood - the Rudolf Valentinos, Clark Gables and Ginger Rogers of the black-and-white silver screen. Maybe, it's being the choice of Frank Sinatra and Bob Hope alike for winter R & R.
Indian Springs delivers budget golf that's revered. Maybe, it's all the trendy shops that can make you feel like Rodeo Drive only relocated 100 miles to the south. Whatever the reasons, Palm Springs still intimidates with the aura of its price tags today. It's almost like people expect Robin Leach to be standing guard at the city limits, examining bank accounts to either grant or deny passage. The golf has to be high end of course, with sky-high greens fees and above it all attitudes. This is Palm Springs. It's where rich folks swing their high-priced sticks on celebrity architect showcase courses. Which is true, but not nearly the whole story. For it turns out that if you go a little bit off the usual resort palace track, the Palm Springs area is home to a number of reasonable, satisfying and sometimes shockingly good plays. Palm Springs golf on a budget? It's more than possible. It might even turn it into the unexpected trip of your life. One that you'll find yourself boasting about proudly to your buddies. Forget trying to run into Paris Hilton at the local grocery store. Great golf steals in the land that humility forgot is where the real thrills are. "In today's world I think we're seeing a shift in people taking pride in getting good values," said Neil Finch, general manager at the Palm Springs area Indian Springs Golf and Country Club. "People used to brag about how much they spent on something. Now, they brag about how much they saved." Finch likens it to looking beyond the Morton's and Ruth's Chris and finding that hidden gem steakhouse where "you can get out the door for less than 70 bucks." Surprisingly, the Palm Springs scene includes a good share of these golf equivalents. "People can hear Palm Springs and become intimidated because they're sure it's going to be expensive," said Tim Hurja, who has run a golf packaging service centered on the Coachella Valley since 1992. "When if you look at it, Las Vegas has probably already surpassed us in average greens fee. "Palm Springs has got quite a few good courses that would fall into the budget category." You can play for less than $100 peak winter season in this desert playground - and play well. This isn't about slumming on two-bit munis where low costs mean high-anxiety greens and patchy fairways. It's about swinging outside the usual golf guide and hotel concierge recommendations for high quality courses that do little national advertising. Call it a hidden hacker's helper to old Hollywood paradise. Indian Springs Golf & Country Club: They actually answer the phones, "Immaculate Indian Springs Country Club" here and it's no mere advertising slogan. Indian Springs' greens are revered by those in the Palm Springs know. They are tirelessly kept rolling a 10 on stimpmeter at all times. "Some people say that Indian Springs is better than (private course Palm Springs legend) Vintage, better than Bighorn," Hurja said. "It's one of those hidden gems with great word of mouth." You could say that. A golfer stopped this writer at the high-profile Greg Norman Course and raved about the non-big-hotel-linked Indian Springs at the far end of the valley. Indian Springs gets golfers on and off its pristine playable track in four and a half hours. It's never more than $99 weekends in high, high season, usually closer to $60 to $79. "It's fun," Finch said simply. "People are playing on a course in good condition, having a great time. When they're done, they usually ask if we have anything the day after tomorrow." Sometimes a budget course steals your heart. Mesquite Golf & Country Club: This is the kind of place the locals actually play. The kind of place that offers regular Sunday champagne brunches and New Year's Eve parties in the clubhouse. Mesquite's low greens fees bring them in (often under $75 even in Palm Springs' ultra expensive peak season). Its mountain backgrounds and golf along the bottom of a stream bed are what bring them back. Mesquite isn't a long course by any stretch of today's standards. It comes in at 6,328 yards from the back tees. But it doesn't just let you bomb away ad nauseum. The driver is taken out of your hands on many of the par 4s (as long as you're not completely John Daly brained). There are eight small lakes out on Mesquite and when the water's running in the stream it plays with some kick. You're going to have some forced carries along with that heavier than usual wallet. At the same time, it's very friendly to women, seniors, anyone who finds distance to be a challenge. Cimarron Golf Resort - Short Course: Yes, it's a short course. But this is one short course where you'll feel more than manly enough playing it. This par 56 with 16 par 3s and two par 4s forces you to make tough shots into small openings. It's in good shape with some dramatic holes. "You actually feel like you're playing golf," Hurja said. "It's the best par 3 course I've ever seen in my life." Did anyone mention you're never paying more than $45 to get on? Suddenly, this short course isn't so puny pathetic, huh? Mountain Vista Golf Club: This 36-hole golf complex in the Sun City subdivision more than lives up to its name. There are views of the Santa Rosa, San Jacinto, and San Gorgonio mountain ranges. That's three mountain ranges for one low price. "It's very reasonable," Hurja said. "It's within a community and a lot of resort golfers aren't going to know it's there, so they have to be very competitive in pricing." This is one of those places that just wants to get golfers out onto their courses, hoping this results in a fair share of interested new home buyers. Which means cheap golf for you. The sister Greg Nash and Billy Casper designs features lakes, palm trees and manmade waterfalls. The Santa Rosa course is the longer of the two, coming in at 6,720 yards. The San Gorgonio course actually boasts a slightly higher slope rating (128) with enough water in play to make you feel like you're in a land of lakes rather than the high desert.